Retired Algerian general faces tough road on election trail - The Maghreb Times ! Algerian presidential candidate Ali Ghediri’s stamina and fortitude are being tested on the pre-campaign trail as he faces resistance from the powerful military-backed government. Ghediri, on January 19, became the first person to officially announce his candidacy for Algeria’s presidential elections in April. He outlined a bold electoral platform and positioned himself as the main challenger to the incumbent government amid what he calls political timidity among other contenders. Ghediri, a 64-year-old former army general, defied repeated warnings from Army Chief of Staff Ahmed Gaid Salah to steer clear of the April 18 elections. Local media referred to the warnings as an “unprecedented artillery barrage from Taguara (the Defence Ministry)” but Ghediri said he knows running for president will be an obstacle course. “I’m ready for it,” he said. Ghediri was barred from attending the funeral February 6 of his former defence boss Abdelmalek Guenaizia. His spokeswoman said Ghediri found the road outside his campaign headquarters barricaded by three trucks. “He was told that the three vehicles were broken down,” the spokeswoman said. She later said a man who was likely from security services told him that authorities did not want him to be at Guenaizia’s burial. His brother, a senior military intelligence officer, was moved from Algiers to a remote area in the south. Salah signed a military order five days after Ghediri announced his candidacy banning soldiers and officers from having any role in the elections. El Watan, Algeria’s most influential newspaper, reported that 13 active army colonels and lieutenant-colonels had been detained on Salah’s orders after they contacted Ghediri to express support. “Such a move will go down in history as unprecedented in the age of the internet,” El Watan’s article, headlined “The heavy-hand of Gaid Salah,” read. Ghediri was also stopped by a road barricade February 7 when he tried to reach the opposition Social Democratic Movement party to pay tribute to its deceased leader Hamid Farhi. Ghediri published three open letters arguing against Algerian President Abdelaziz Bouteflika’s re-election. He said Algerians need a new, strong and honest leader to take command and guide the country. Ghediri distinguished himself from many other presidential aspirants with bold statements against the military establishment. He’s the only candidate to promise to reform the military. Algeria has been ruled by veteran independence fighters before. Bouteflika, 81 and Salah, 79, are from that generation. “If the elections fail to deliver a change to the current establishment in 2019, the result will be crisis,” Djabi said. 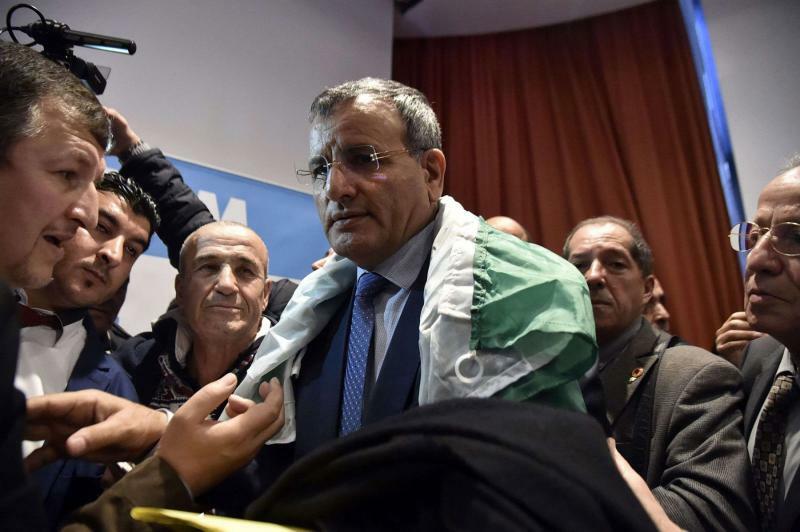 Analysts said the alternative to Algeria’s apparent political impasse could come from retired military men like Ghediri. “Ghediri is part of the first generation of retired high-ranking officers who are very qualified and relatively young, with diplomas and management experience,” said Djabi. He also stated that Ghediri is not the exception and that the number is going to increase. “They could be the solution to the crisis of political elites,” Djabi said citing the examples of Israel, Russia and South America. Bouteflika, in power since 1999, is widely popular but his apparent health problems have raised questions about his ability to continue to serve. Four main parties, including the National Liberation Front, have planned a rally to read out a letter from Bouteflika announcing his candidacy, though. “I’m ashamed of my country. We have become the laughing stock of the world,” said an Algerian citizen on social media in reaction to a possible fifth term in office for Bouteflika. “History will condemn us for our silence. The re-election will confirm our failure as a nation,” wrote another citizen.